Apple to Enable Campus ID Cards in Wallet but Doesn’t Announce Opening of NFC Chip | NFC Times – Near Field Communication and all contactless technology. Apple will enable campus ID cards starting this fall in its NFC-enabled Wallet, but the tech giant has not said it would open up its NFC secure element to third-party developers, as was speculated. 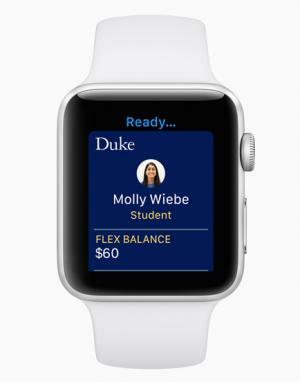 NFC TIMES Exclusive Insight – Apple will enable colleges and universities to add NFC-based student ID cards to its Wallet with OS upgrades to its Apple Watch and iPhone, the tech giant announced Monday on the opening day of its Worldwide Developers Conference. It means students with Apple Watches and also properly equipped iPhones would be able to tap their devices to access campus buildings and to make purchases such as food, laundry, books, and copying or printing on campus and at some off-campus merchants, using the NFC interface. But in a keynote introducing its latest mobile and watch operating systems, Apple did not say it was opening up its secure element to third parties for use as hotel keys or any other application, such as payments, as was widely speculated in the run-up to the conference. Apple’s embedded secure element mainly stores credit and debit card credentials, including tokens and cryptographic keys, for banks and other issuers. Although Apple says it locks the chip mainly for security, the company needs to strictly control the chip for its Apple Pay business model. Apple charges a transaction fee from the issuers to enable their payments cards on the chip. Article has about 810 words.